For almost seven weeks, I have had the privilege of spending every day with the women of Mi Perrito Cooperative in Villa Elisa, Argentina. Through my internship, I have had the ability to see the trials and tribulations that face start up business in impoverished communities. I have also witnessed the power of community support as the women of the cooperative have tried to create a successful project with the hope of providing not only for their families, but for the improvement of their neighborhood. 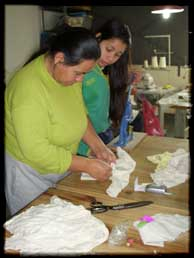 The sewing cooperative was started two years ago by a couple of mothers whose children attended Arco Iris, a community center that provides educational and social development as well as nutritional meals to over 70 children in the neighborhood. Before I arrived, the group had focused solely on the production of dog clothing. This endeavor had been fairly profitable, but the group had reached a plateau in sales. Also, this past February, a terrible flood hit the area, wiping out a significant portion of their stock, as well as forcing them to spend much of their budget on the repairing of their sewing machines. A few months previous to the start of my internship, though, they received a contract from a fair trade association based in La Plata called Otro Mercado to make baby clothing. 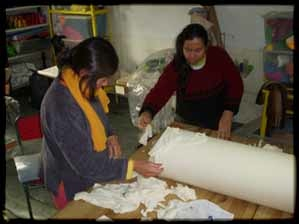 Within my first few days, representatives from Otro Mercado came to the cooperative to bring the necessary materials to carryout the order, including a professional fabric cutter. After two or three days of use, it was obvious that this machine would become a lifesaver for the group. Work that used to take them and hour now took ten minutes, as they were able to cut multiple layers of fabric at once. In turn, the project I ultimately decided to pursue was the purchase of a fabric cutter and other organizational materials that would turn the workspace into a sewing shop. I realized that what the cooperative was lacking was neither skill nor initiative to further their production capacity, but simply capital. The women were fully capable of creating higher quality products, yet without the necessary tools, they were forced to rely on dull scissors and faulty machines and to work in a cluttered room that doubled as a closet for the center. One of the women, Isidora, corroborated my discovery as she recounted her history with the cooperative. 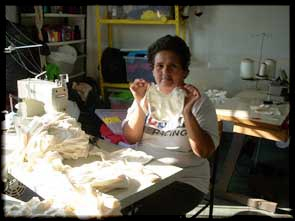 She told me that when she first started with the group, she imagined what it would be like if one day they could have professional sewing machines and a workshop that no longer used second hand tools. There is no way to completely recreate how her eyes lit up as she described her pride and excitement when, after only a few months, the new sewing machines the group had bought with a loan arrived. She had always dreamed of running this cooperative as an actual business, but the women had never been given the opportunity to utilize high quality capital. The aspirations of all the women are as equally apparent as those of Isidora. When their children run into the workshop to see what “Mom” is working on, they have a great deal of pride as they show them the newest design or technique they are using. At the end of the day, all of their work is done so that their children will have better opportunities. However, they don’t even realize their most significant impact, though it is apparent to all those around them. No matter what financial gains they make for their family, the most important aspect of their work is the example they have set for all the children of the neighborhood as female entrepreneurs, succeeding even despite their poor odds because of their location in an impoverished community.